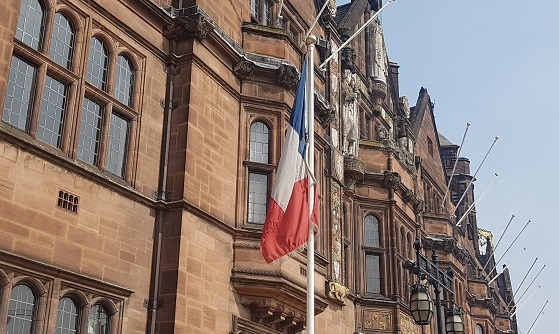 The French flag is flying outside the Council House. Our hearts go out to you, our brothers and sisters in the cathedral and civic community in Paris. To see the roof of your beloved Cathedral brings to mind our own destruction in 1940, in the terrible years of war. And more recently in 2001 we were, in our own Cathedral, again threatened with fire, though not with destruction. You will feel that your heart has been taken from you, but God still holds your life in his hands, and will give you grace to rebuild, as he did for us. For now, though, your grief will be inconsolable and our hearts and our prayers are with you from this city and this community. We pledge our support as you seek to rebuild your great Cathedral and renew your life together. As those who have known the pain of loss and experienced the partnership of hope which can gather around such loss, we join you in a shared act of Easter faith to see your wonderful Cathedral rebuilt, as ours has been. From the people of the City and Cathedral of Coventry.